﻿ Are Tobies Reef Safe? 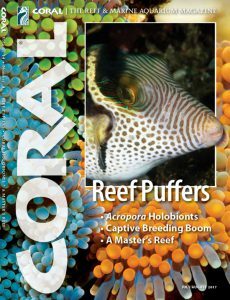 CORAL Magazine cover, July/August 2017. Image by Scott W. Michael. Click cover to take survey now. ARE TOBIES SAFE IN REEF AQUARIA? Take part in the definitive CORAL Magazine Survey, with a chance to win a free full set of Scott Michael’s Adventurous Aquarist Guides to Saltwater Fishes & Marine Invertebrates. Have you owned and kept a Canthigaster Toby (Sharpnose Puffer) in one of your aquariums? YES. I’ll Take the Survey about its behaviors. NO. Take me back to the latest news.